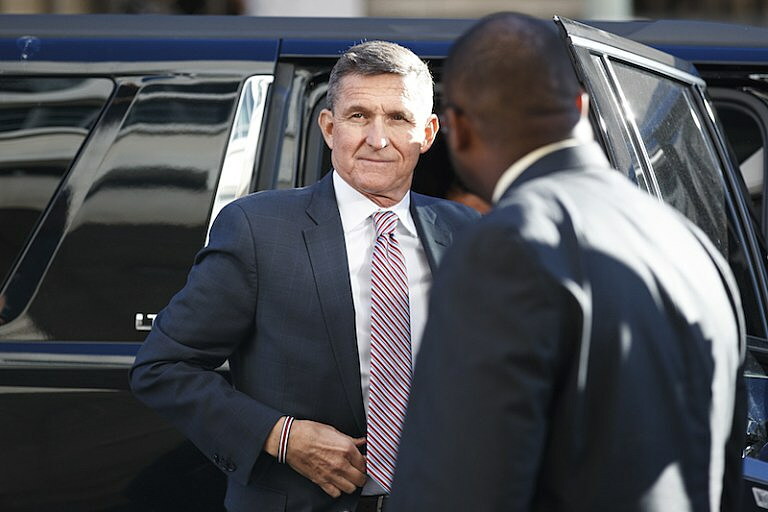 WASHINGTON (CN) – Facing unexpected condemnation from a federal judge, former Trump national security adviser Michael Flynn requested a delay Tuesday of his sentencing for lying to the FBI. U.S. District Judge Emmet Sullivan was quick to signal dissatisfaction with Flynn soon after the long-awaited hearing got underway at 11 a.m. Though the government has recommended that Flynn spend no time behind bars, leniency appeared unlikely when Sullivan expressed “disgust” and “disdain” for Flynn’s crimes. Nominated to the bench by President Bill Clinton, Sullivan repeatedly emphasized he is not bound by the government’s sentencing recommendation and could not guarantee Flynn would escape jail time. An hour into the hearing, Sullivan recessed the court after Flynn requested time to talk with his attorneys about whether he wanted to go forward with sentencing. After returning from the break, Flynn’s attorney said they wanted to delay sentencing so that Sullivan can take into account the full amount of cooperation Flynn has provided. Specifically mentioning a case unsealed Monday against two former associates of Flynn, Robert Kelner, with the firm Covington and Burling, said it is “likely” Flynn will be called to testify in that proceeding. Brandon Van Grack, a prosecutor with Special Counsel Robert Mueller’s office, said earlier in the hearing Flynn had already provided “substantial assistance” and could still provide useful assistance going forward. Since pleading guilty last year, Flynn has met with the government 19 times, Van Grack said. Sullivan noted that continued work with the government could help Flynn net a lighter sentence. Sporting a dark gray suit, Flynn sat between his attorneys at a long wooden table in the courtroom on the fourth floor of the E. Barrett Prettyman U.S. Courthouse in downtown Washington, D.C.
Sullivan’s questions were unusually harsh for a sentencing hearing, with the judge at one point even raising the hypothetical of whether the government could have charged Flynn for treason. Sullivan returned to the treason issue after returning from recess, as well, saying his hypothetical question should not be interpreted as a suggestion that Flynn committed treason. Van Grack also took the opportunity to clarify his answers to Sullivan, saying the evidence in the case did not support treason charges. “The government has no reason to believe the defendant committed treason,” Van Grack said. Flynn, who served in the Trump White House for less than a month, has been cooperating with Mueller’s investigation into Russian efforts to influence the 2016 election since he entered his plea. His path to sentencing appeared straightforward, with the government recommending a light sentence and possibly no jail time. That took a turn last week, however, when Flynn accused the FBI of tricking him by encouraging him to appear for a January 2017 interview without an attorney and not informing him that lying to federal agents is a crime. Judge Sullivan unsealed documents Monday night that reveal details of Flynn’s interview with FBI agents. Prosecutors filed the documents with Sullivan last week after Flynn levied the allegations of misconduct in a sentencing memo. The documents, which are partially redacted, show Flynn’s interactions with Russian ambassador Sergey Kislyak, including texts, phone calls and trips to Russia. According to the statement of offense filed in the case, Flynn lied to the FBI about talks he had with Kislyak and other foreign officials during the transition. Flynn also lied in official documents filed with the Justice Department about the Turkish government’s involvement with projects his company undertook, according to the statement of offense. President Donald Trump cheered Flynn on Twitter Tuesday morning, again denying allegations that his campaign had an inappropriate relationship with Russia.